, an eminent mathematician, physician, and botanist, the son of a schoolmaster at Lubec, in Germany, was born October 21, 1587. His mother was daughter to a clergyman of the cathedral church at Lubec. 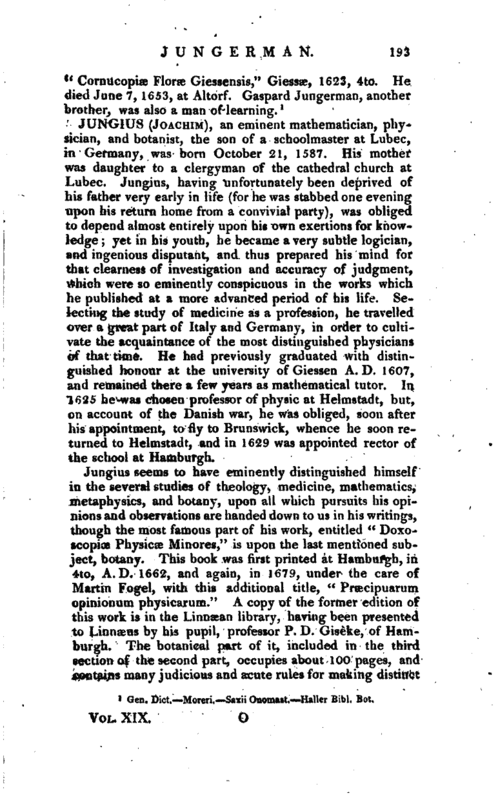 Jungius, having unfortunately been deprived of his father very early in life (for he was stabbed one evening upon his return home from a convivial party), was obliged to depend almost entirely upon his own exertions for knowledge; yet in his youth, he became a very subtle logician, and ingenious disputant, and thus prepared his mind for that clearness of investigation and accuracy of judgment, which were so eminently conspicuous in the works which he published at a more advanced period of his life. 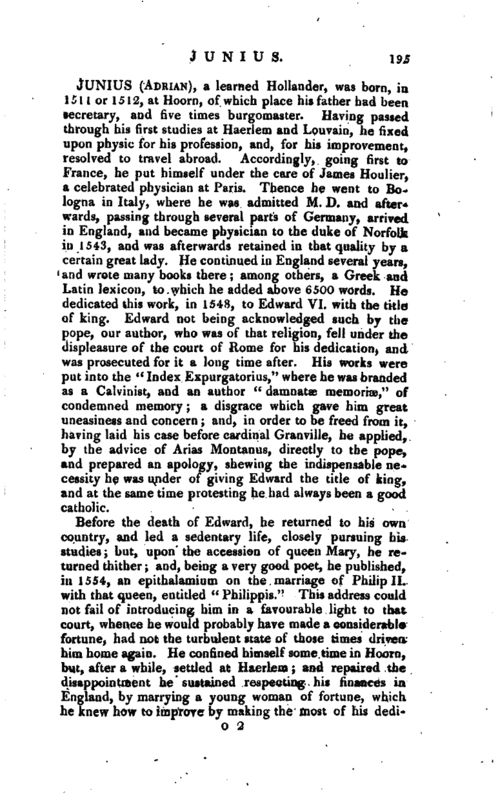 Selecting the study of medicine as a profession, he travelled over a great part of Italy and Germany, in order to cultivate the acquaintance of the most distinguished physicians of that time. He had previously graduated with distinguished honour at the university of Giessen A. D. 1607, and remained there a few years as mathematical tutor. In 1625 he was chosen professor of physic at Helmstadt, but, on account of the Danish war, he was obliged, soon after his appointment, to fly to Brunswick, whence he soon returned to Helmstadt, and in 1629 was appointed rector of the school at Hamburgh. Jungius seems to have eminently distinguished himself in the several studies of theology, medicine, mathematics, metaphysics, and botany, upon all which pursuits his opinions and observations are handed down to us in his writings, though the most famous part of his work, entitled “Doxoscopiae Physicze Minores,” is upon the last mentioned subject, botany. This book was first printed at Hamburgh, in 4to, A.D. 1662, and again, in 1679, under the care of Martin Fogel, with this additional title, “Prsecipuarum opinionum physicarum.” A copy of the former edition of this work is in the Linnoean library, having been presented to Linnæus by his pupil, professor P. D. Giseke, of Hamburgh. The botanical part of it, included in the third section of the second part, occupies about 100 pages, and contains many judicious and acute rules for making distinct | species of plants, as well as some curious remarks upon genera. He was a great critic in botanical nomenclature; and constructed a variety of terms which agree with those of Linnasus, and his remarks upon botanical discrimination have been of considerable advantage to succeeding botanists, and many of his definitions are repeatedly made use of by our immortal countryman, Ray. 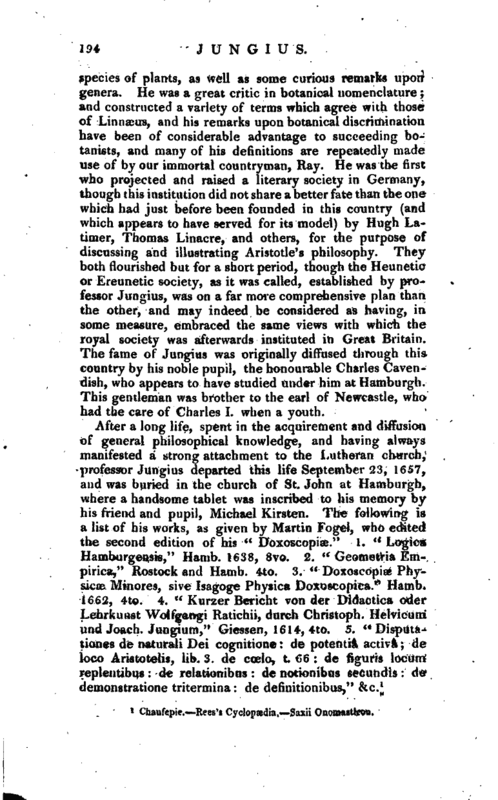 He was the first who projected and raised a literary society in Germany, though this institution did not share a better fate than the one which had just before been founded in this country (and which appears to have served for its model) by Hugh Latimer, Thomas Linacre, and others, for the purpose of discussing and illustrating Aristotle’s philosophy. They both Bourished but for a short period, though the Heunetic or Ereunetic society, as it was called, established by professor Jungius, was on a far more comprehensive plan than the other, and may indeed be considered as having, in some measure, embraced the same views with which the royal society was afterwards instituted in Great Britain. The fame of Jungius was originally diffused through this country by his noble pupil, the honourable Charles Cavendish, who appears to have studied under him at Hamburgh. This gentleman was brother to the earl of Newcastle, who had the care of Charles I. when a youth. 1 Chaufepie. Rees’s Cyclopaedla. '—Saxii Onomastico*.